David Blue came home to find his front and back yards a mess. 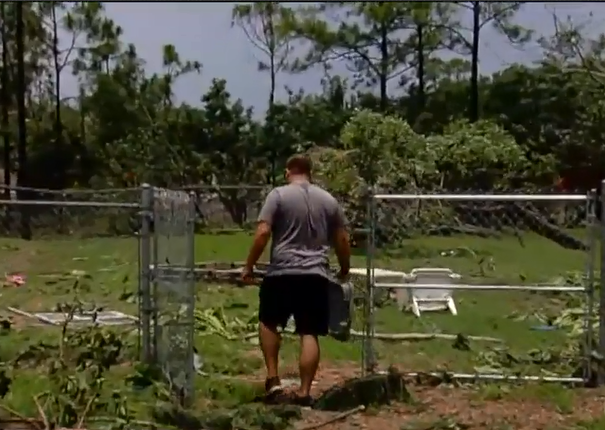 The trees he used for shade uprooted, lawn chairs and kids toys thrown everywhere. "I was at work last night and got a call from my neighbor this morning that a tornado had come through. I got home and see a mess." So, after walking around his yard, Blue checked his home surveillance video to see the storm approach then strike. At first things seem calm. Around 5:34 a.m., the wind picked up and large items flew by the camera that faces the backyard. "Fence knocked down and I know some other people have it worse," Blue said. Half a mile away, the Madrigals were hunkered down in their home when the tornado touched down. "We started hearing this loud roaring noise and we started hearing crashing sounds. so immediately my husband said grab the kids and said get in the closet," Rosa Madrigal said. Her husband Duval added, "I am thankful that we have our lives. And that my neighbors in Loxahatchee are safe. This table over here it must have picked it up and flipped it and smashed it right there with this umbrella which was on top of there, as well." Monday morning, the Madrigals showed me their backyard, signs that a tornado spun through. Almost their entire deck was covered with broken glass. 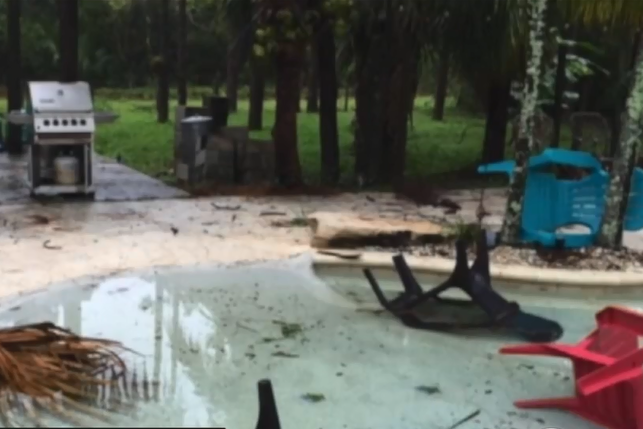 "These plastic chairs were all lined up around here and all got blown that way into the pool. It was no ordinary start to the day. Rosa Madrigal knew something was wrong. "I was startled awake around 5:40 a.m. with an urgency to pray, and so that's exactly what I did. I immediately went to prayer." She then heard her phone alert her to a tornado warning. "We started hearing like crashing sounds and immediately my husband said grab the kids get in the closet." "I started hearing what I knew was hail hitting my roof and all of a sudden I heard like a jet engine started to wind up, rev up," Duval said. Later, the Madrigals went outside to see what was damaged. "We knew God protected us through all of this," added Rosa.